Enlarged isometric diagram of the "Newstead" Type Lorica Segmentata body armor, adopted by the Roman Legions in the latter years of the First Century AD. It was a much simpler and easier to produce version of this armor; having fewer components than the earlier "Corbridge" type. 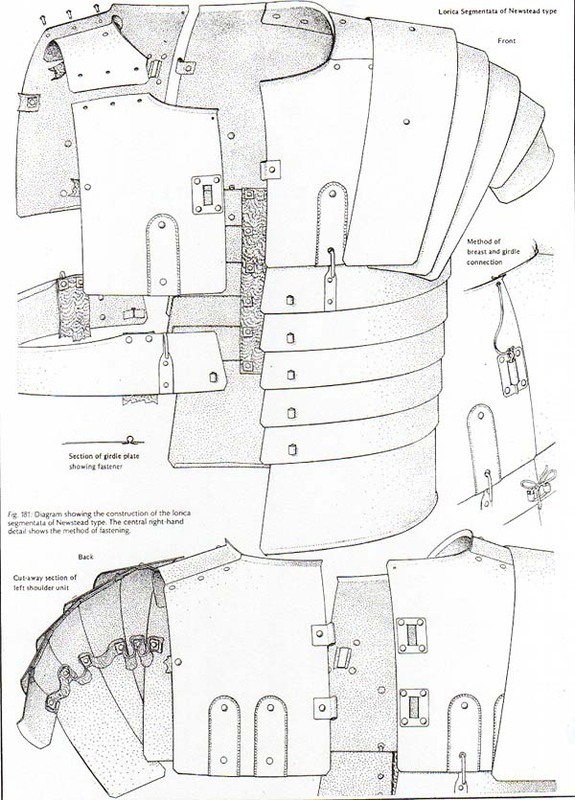 The Newstead lorica had only six girdle plates, with the bottom unit being twice the depth of the others. The six small independent upper back plates of the Corbridge lorica are replaced by a single rigid shoulder and upper back plate on each side. The right and left halves of the shoulder assemblies were joined using a stronger, but less flexible system of loops and pins. The "Newstead" was less comfortable to wear than the "Corbridge", lacking the "hinged" three piece shoulder defense; and having fewer; but, larger plates; thus being less flexible and less conforming on the wearer. Loop fasteners rivited to the front and back girdle plates, as used on the Corbridge lorica, are replaced by simpler flat loops of bronze secured like paper clips; their ends being inserted through slots in the ends of the girdle plates and bent outwards against the backsides. As in our current times; when there where large numbers of soldiers to be out-fitted; simpler, easier, cheaper and quicker ways were found to manufacture the equipment they needed or required. Ancient Rome was no different when faced with providing equipment for its thousands of legionaries. The "Newstead" was the final form of this "laminated" type armor; which fell out of favor in the early Third Century AD, when the Roman Army returned to the use of the earlier Lorica Hamata chain "ring" maile armor.